Welcome to the Guide on Bowmaster/Sharpshooter Skill Build! This would be a general Hybrid skill build for all Magic Bowmasters. As this picture below shows what skills I would add in my opinion, I have used up all the Skill Points available. Nonetheless, I would explain all the arguable skills in the discussion. Physical skills tend to have longer cooldown time, while Magic skills have shorter cooldown time. Even though the Revolutionary Ballista (Magic Lv40 skill) is being added and Extension Arrow is being levelled high in this skill build, you can add the Pinpoint Shot (Physical Lv40 skill) and level Charged Shot high if you intend to go the Physical build. 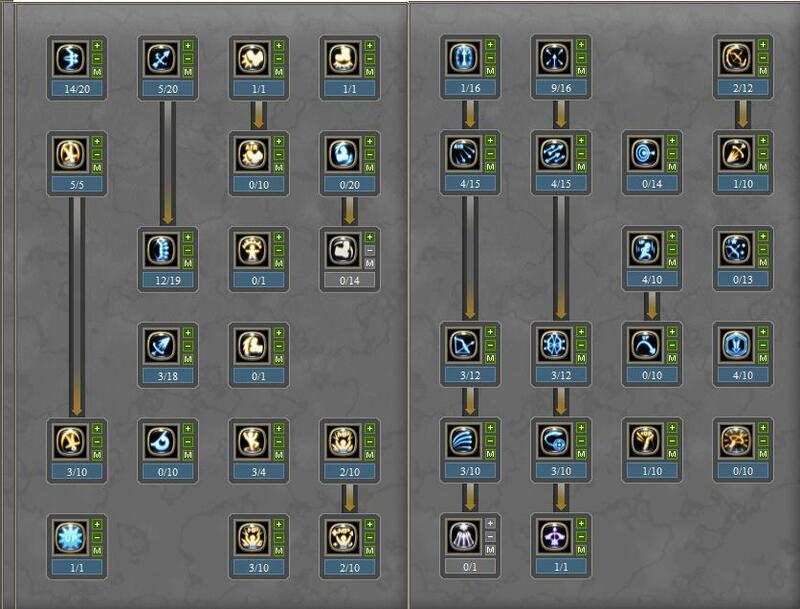 For pure Physical or Magic builds, the other type of skill tree will be ignored to focus on dealing a high pure damage. More spammability of skills to consistently generate high combos. In the upcoming 2nd job patch (Artillery), a new skill will amplify Physical attacks for a certain duration. This means your Arrow Shower will be strengthened a lot more. Having both Physical and Magic attacks gives you more options in attacking enemies. Some enemies may be insanely strong in Physical Defense, but weaker in Magic Defense, and vice versa. Able to have both small and huge AOE skills, as Physical has larger AOE while Magic has smaller AOE. Lower skill damage compared to pure builds. For pure builds, they are able to level their skill high, which in turn increases that particular skill damage output. As Bowmasters are an Agility class, Physical attack is higher than Magic attack if no equipment is being worn. Even when you are using Intelligence and Magic equipment, You need to enhance them to a certain degree before having your Magic attack exceed your Physical attack. Pinpoint shot is arguably the best Lv40 skill in terms of DPS. Getting Revolutionary Ballista improves more on your AOE capabilities. Without further ado, let’s take a look at the skill build I have in mind. Alternatively, if you want to create your own build, you can go to the Resources Tab of this blog for the simulator. Twin Shot – A fast-cast attack with only a 4.5 second cooldown. Definitely one of the best DPS skills available in both PvP and PvE. Just spam it as often as you can as a filler in between your skill combos. Max this or level it high. Piercing Shot – In this case, I have put this on pre-requisite level as this skill is not really used in my game. However, some other Bowmasters have levelled this high because of its range compared to Multi Shot. Revolving Hit – Bowmasters are never a melee attacker. Don’t learn this. Multi Shot – Contrary to Piercing Shot, this is a 7-arrow mid range attack that deals quite a fair bit of damage. The down side is only the long cooldown time. Level this high, or the Piercing Shot. Magic Arrow – Not a good DPS skill, but it is a good attack skill that forces enemies to be immovable for a slight moment. Quite a decent skill for PvP. Leave it on pre-requisite. Owl’s Insight – Gives you additional chance to score a critical in your attacks. It is usually used when you are using a high damage skill such as Guided Shot, Arrow Shower, Pinpoint Shot and Revolutionary Ballista. However, as you level higher and your equipment gets better, this may be rendered useless as your Critical Chance will be decently high due to the Agility Stats. Either add this at Lv1, or don’t add it. Eagle’s Rage – A party Critical buff that last for about 10 seconds. A skill that doesn’t requires any SP, so a definite must-have skill. Spin Kick – Default skill. Leave it. Low Spin Kick – Default skill. Leave it. Tumble – Your bread and butter to dodge any attack. Max it. Moon Sault Kick – Useless for Bowmasters. Pin Wheel – When you are being knocked down on the ground, you can attack the surrounding enemies with multiple kicks and regain your position. Some Bowmasters prefer not to add this as you can use the tumbling method to get away from the enemies, while some add this to be more assured. High Spin Kick – Useless for Bowmasters. Somersault Kick – Useless for Bowmasters. Urgency Trick – Gives you an additional chance to avoid attacks, or regain your position after being attack. Put this at minimum Lv1. Increase it if you have spare SPs. Aerial Evasion – Regains your position when you are being hit to the air. Put this at minimum Lv1, and increase it if you have spare SPs. Mental Mastery – Increases your MP limit. Useless as skill’s MP consumption is based on percentages. However, this is a pre-requisite for Mental Training. If you have spare SPs to add to Mental Training, put this at pre-requisite level. Physical Mastery – Increases your HP limit. HP is very important in Dragon Nest, however, Bowmasters usually have low HP and this increment from the skill may not be as great. Add this if you have spare SPs. Mental Training – Having trouble with insufficient MP? Add this for faster MP regeneration if you have spare SPs. Charged Shot – A shot released after charging for a few seconds. This skill is usually not favoured for Magic Bowmasters because the charging time may get you dead before releasing the arrow. A Heraldry Plate can be used to quicken the charging time. Add this high if you are a Physical Bowmaster. Level this as high as possible, depending on your SPs. Extension Arrow/Scope Arrow – A good DPS skill with a relatively low cooldown. However, you have to be precise in your aiming in order to succeed a full-force damage attack. For huge bosses, the aiming will not be important because you will definitely hit the boss unless… A good skill in PvP as the splitted arrows can disrupt enemies who are casting skills. Level this as high as possible, depending on your SPs. Bull’s Eye – Increases the damage of Range-type attacks when the enemy is being aimed with this skill. This is useful only when you have a team with several range classes. The damage amplified for the Bowmaster herself alone is not that significant. The SPs can be better spent at other skills. Level this high depending on your SPs, or simply don’t add this. Aerial Chain Shot – An attack activated when you are in the air. This is usually not used as a DPS skill, but a continuation after Triangle Shot. This gives you extra air time to avoid any ground-based attacks. Leave it at pre-requisite. Rapid Shot – Shoots several arrows around you. A decent skill that attacks nearby enemies. Put this at pre-requisite. Spirit Excellation – Increases your Agility stat for 1 minute. Add this high if you have enough SPs, if not just leave it at Lv1. Ankle Shot – Superb skill in both PvE and PvP. Able to bind enemies at their position once hit. The damage when all 3 arrows hit are considerably high as well. Add this as high as possible if you have enough SPs to increase the duration of bind. Siege Stance – Puts you stationary at a particular position to shoot several arrows in Critical. Only use this when you are sure that you won’t be hit easily by enemies. Leave it at pre-requisite. Swift Shot – Shooting several arrows in front. A decent attack. Leave it at pre-requisite. Sylph’s Aid – Increases the range of Bowmasters. What is the best advantage of Bowmasters compared to other range classes? It has to be range of course. However, this skill only affects certain skills such as Twin Shot and Piercing Shot. I wouldn’t add this in my opinion, but some Bowmasters add this for PvP usage. Stunning Shot – Stuns the enemies for a slight duration. This is probably mostly used in PvP. Leave it at Lv1 as the chance of stunning is 100%. This skill is not meant to be a DPS skill. Arrow Shower – Superb damage skill when all arrows hit. Take note that only falling arrows deal the full damage. If the arrows hit the enemies when ascending instead of descending, the damage will be reduced by a very huge amount. Max this. Guided Shot – Another superb skill for Bowmasters. Insanely high damage plus a decent low cooldown, and the arrows are GUIDED towards a target/group. The only downside of the skill is that the targeted enemy is hard to aim. For example, if the Cerberus boss spawns its little minions, your Guided Shot may not hit the boss but the minions instead. Max this. Fake Shot – A continuation attack of your Tumble. Leave it at pre-requisite. Triangle Shot – The best dodging skill available for Bowmasters. It increases the invulnerability time after you tumble, while sustaining you in the air to avoid any ground attacks. Coupling this with Aerial Chain Shot will give you an air time of about 3-4 seconds. Leave this at Lv1 as it is not a DPS skill, and neither will the cooldown be reduced. Longbow Mastery/ Crossbow Mastery – Max either of this depending on which weapon you choose. Longbow features higher Critical, longer range and a higher Physical attack. Crossbow features higher Magic attack, and a shorter range. Usually all Bowmasters will pick Longbow due to its long range, critical, and its appearance. Pinpoint Shot/ Revolutionary Ballista – Pick one of these depending on your preference. However, picking one of these doesn’t mean you cannot use a weapon with a stronger stats on the other attack type. To illustrate, it is not unwise if you pick Pinpoint Shot when you are using a bow with much stronger Magic attack. Your skill may not be as strong if you use a Physical Bow, but the damage improvement on your fast-cooldown Magic skills can increase your DPS as well. That is all. A 2nd job skill build post will be posted when I am confident that it is a good one. Feel free to add in any comments or suggestions regarding the skill build. Posted on July 19, 2011, in Bowmaster/Sharpshooter and tagged Bowmaster/Sharpshooter, Dragon Nest, Guide, Skill Build. Bookmark the permalink. 18 Comments. Awesome Review on BM skill. Great Job!! Btw I’ve a Lv50 BM going Sniper build that needs some adjustment or comments, I hope you can help me. Owl Insight for ensuring critical hits on powerful skill like Shower/Guided Arrows. Bull’s eye to ensure DPS when no criticals is done. Max Piercing Shot instead of Multi Shot cus it’s a good skill when soloing, it’s not that hard to gather mobs in a straight line, damage is considerable high when max & more safer to use than compared to Multi Shot. Spirit Excellation @ 5 since lv6 only increase it by 1.5% instead of 2%. Unless I could hit a high amount of Critical example around 13 to 17k of critical then only SP reset it and removed Bull’s Eye & Owl Insight. I doubt it will be easy to hit high on critical stat since DN SEA isn’t using old system. My doubt is whether should i down Piercing Shot to pre-requisite & add those points to Urgency Trick, Aerial Evasion & Pin-Wheel. What do you think? Comments on my build are gladly welcome. As for Bull’s Eye, I had several discussion with my fellow guildmates previously. The time that you spent to cast the skill, could be better off using it to cast another attack skill. Unless, you have a 4-range party, or maybe more in dealing with Sea Dragon. Yup, I was thinking of adding Piercing Shot once I get to 2nd job instead of Multi-Shot. I added Multi-Shot for the higher damage and instant cast time. Piercing Shot requires you to turn for a second which may be fatal in certain occassions. However, I do agree Piercing Shot is preferred due to its range, and Bowmasters are indeed a range class! As for your doubt on downing Piercing Shot to pre-requisite for Urgency Trick, Aerial Evasion and Pin Wheel, probably you have to question yourself how often do you use Piercing Shot? As Bowmasters have low HP, you should be trying to avoid attacks most of the time. When dealing with PvE, probably Lv1 Aerial Evasion and Lv1 Urgency Trick would be sufficient. However for PvP, you can consider downing Piercing Shot and add to these 3 skills, especially Pin-Wheel. Why so? In PvP, if your opponent notices that you do not have Pin-Wheel, he can simply stand on your character and attack you once you recover your position. Because with Pin-Wheel, you can attack him away when he stands on your character. So I guess it’s a matter of choice PvE and PvP preferences. I hope this helps, and feel free to comment on this! Hmm, what do you think about Shower/Guided Arrows? Since Guided arrows is mag base and i doubt you can get high on mag item unless lots of golds/cash is spent. I wonder how much of difference is Lv1 Shower compare to lv7? Shower Lv7, every arrow deals 38%+208 VS Shower Lv1, every arrow deals 37%+44. Lv1-3 would have a base of 37%, and Lv4 onwards, the base would be 38%. So I would recommend at least having a Lv4 Shower, unless you are really short on SP. If I am not mistaken, Shower deals around 60+ arrows when hitting one target, but that doesn’t mean 10 mobs will deal 600 combos. If you played a BM before you will know what I mean, but that’s how it is. If you want to compare Lv1 and Lv7, [60 X (1% X Physical Attack + 164)]. Assuming you have 2500 Physical Attack, you do the maths. As for Guided Arrows, if you are using a Physical Attack Bow, levelling this skill may not be as efficient if you put those SPs on other Physical Attack skills. In my opinion, at least Lv1 would be required. For your reference, Lv1 Guided Arrows: 96%+136. Lv7 Guided Arrows: 101%+672. Such a great review!! good job!! i ‘m looking forward to your preferences 2nd job skill build ( Artillery and Sniper). can i follow the picture? in other words, if i copy the ammount of lvls i raise a skill from the picture, will it work? or do i have to follow the instructions below. Oh and can you please explain what pre-requisite means? I was also wondering what skill i should enhance using a quiality skill enhancment. I’m playing in america and the level cap is 24. Thanks! It would be better if you exercise your own judgment after reading my comments on each skill. The picture I have provided is only for a reference. Pre-requisite means the minimum number of levels required in order to unlock the next skill. For example, to unlock Revolutionary Ballista, you need Lv3 of Guided Shot. Lv3 would be the pre-requisite. If you’re going Artillery, I would recommend Extension Arrow for damage increase. (The Lv15 Magic Skill). If you’re going Sniper, I would recommend Charged Shot for 50% cast time reduction (The Lv15 Physical Skill). Twin Shot would be nice as well. In any case, feel free to look at the Heraldry Guide I posted for Bowmasters. By saying phys would be easier, meaning that your physical attack stat would naturally be higher? If that is what you’re saying, probably it is true. However, considering the fact that 2 of the Physical Skills require extreme caution in using (Siege Stance and Arrow Shower), 1 being an extended dodging skill (Aerial Chain Shot), you are only left with Charged Shot as a spammable DPS skill under the Bowmaster tree. Looking over at the Magic tree, all of the skills have decent low cooldown, which allows you to spam them most of the time. You may have a lower stat, but you are ensured of continuous DPS. However, I’m not against a total pure physical build. It is just my own opinion that a Hybrid/Magic, or Hybrid/Physical would be better. Thanks for the reply. Man buying charged shot 50% action reduction and 20% twin shot was expensive! in totale 3200 gold D: but i got it done. I also bought destructive fierce life giving and windswept plates for my crests. I was also wondering when the next cap is coming out, and if it exceeds or meets the 2nd job advancement. So pinpoint shot would be for phys and ballista for magic dmg? Hi! May I know which is better in pve? Artillery or Sniper? And can i follow your build if i’m concentrating solely on pve only? Both are good in PvE, but Sniper may be a little better because of the Flower luring thingy. This is a bowmaster guide that focuses a little more on PvE, but it does fine in PvP too. I mostly pve with a group of other friends, which include a sorceress, and one cleric and warrior.. we are still at our first job class, not sure what skill build are good for bowmasters. I keep seeing conflicting views and builds. So does anyone know where i can find a gd skill build for bm’s who pve with friend most of the time? does any have a pure physical built instead of hybrid?